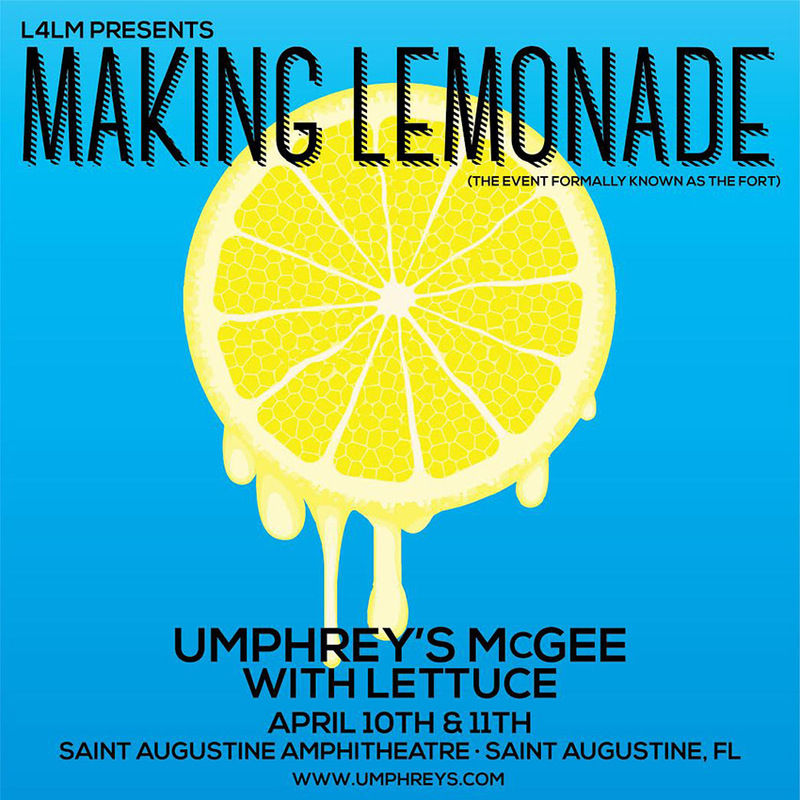 We look forward to seeing you this weekend in Saint Augustine for Making Lemonade with Umphrey’s McGee and Lettuce. ​T​he fine folks at the St. Augustine Amphitheatre h​ave gone above and beyond to help us ​make this weekend an incredible experience. With their assistance​,​ we have compiled some information below for those of you camping for the weekend. It is extremely important to respect the Amphitheatre grounds, as we want to come back for future events and they have really gone out of their way to accommodate our needs. If you see any of their staff, be sure to thank them for their efforts! Note: Every individual intending on camping requires a camping pass. Camping passes are sold out and no more will be made available at camping check in. On Saturday, please be respectful and aware of vendors coming in early for Saturday Morning Farmers Market (arrive 7:00 am). There will be a plethora of great food and beverage options for you as market hours are 8:30 am to 12:30 pm. More info here. In addition, we’ll have a variety of food trucks inside the lot every afternoon. Please find the weekend’s updated schedule below. We have officially locked down a new location for the weekend’s late night affair. 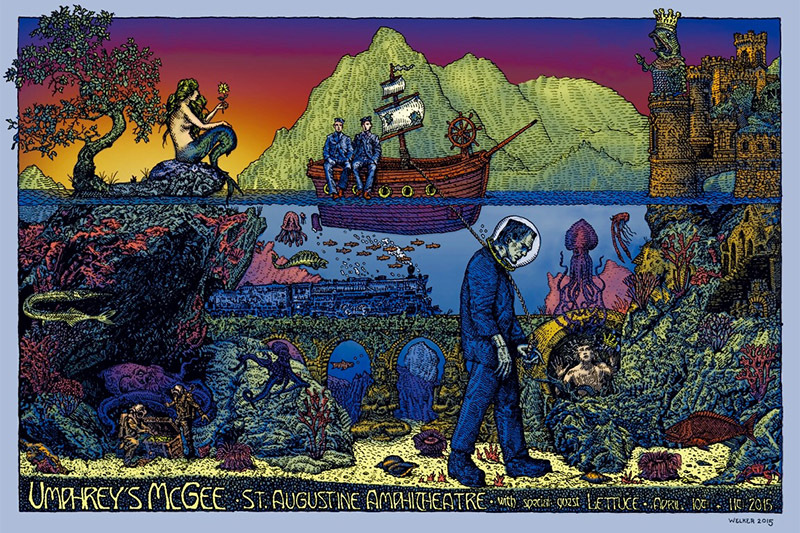 Located a mere stone’s throw from the St. Augustine Amphitheatre, the Elks Lodge (true story) will be home to the Omega Moos on Friday 04.10 and The Band formerly known as the Fort Clinch All-Stars on 04.11. The Elks Lodge is slightly larger than the original venue allowing for the release of additional tickets beginning tomorrow, Saturday April 4th, at 12:00 pm ET. We regret to inform you there will be no Bingo. We hope you’ll manage. We are pleased to offer re-entry on both days to maximize your enjoyment. You will receive a wristband upon entry that will allow you in and out of the venue as desired. There are still a limited number of camping spaces available for those that expressed interest. Primitive camping will be located a short walk from the venue entrance. Cars will not be permitted in the camping area however you will be able to drop your gear a short distance from your campsite and park nearby. Additional camping info coming as soon as we have it. A note about poster redemption: The Fort ticket holders will only be able to pick up their complementary Welker print at the merchandise booth. We are unable to accommodate requests to ship prints after the event. All Fort ticket holders will be receiving emails today to initiate refunds should you not be able to join us. Immediately following umVIP entry, all The Fort ticket holders will receive early entry into the venue and the first 600 will receive wristbands to allow for first access to the GA pit directly in front of the stage. In addition, The Fort ticket holders will also have access to 100 Level seats to make sure you have the best possible viewing location. 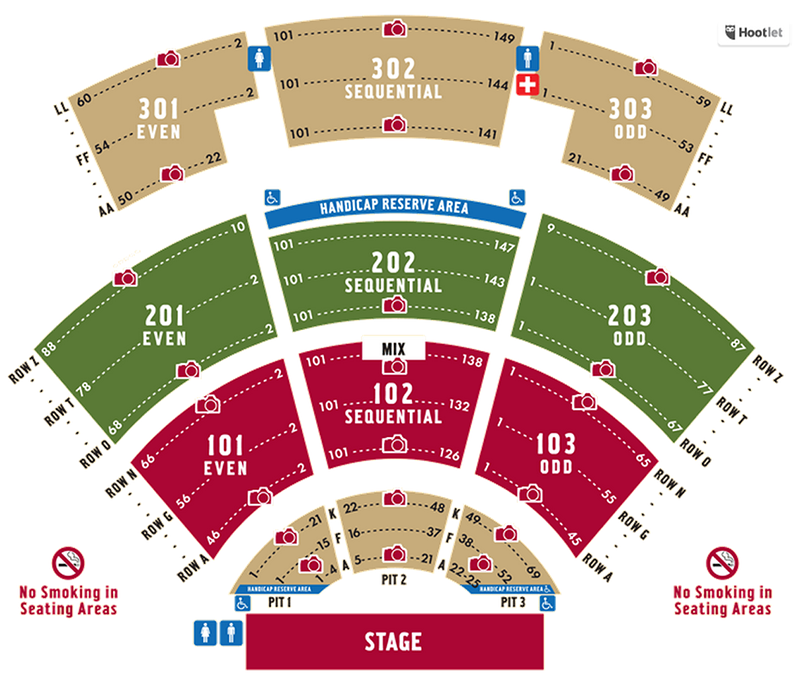 While ticketing outlets appear to assign seats, it should be noted the entire venue will be General Admission (with the exception of a small portion of Section 102 reserved for umVIPs). Clickable seat map below. The early access described above is in addition to the Welker event poster and the audio downloads for both UM and Lettuce shows. The Fort ticket purchasers not interested in these amenities can get a full refund of their tickets and purchase new tickets starting today. Refund info to come. Please note that the $150.00 The Fort ticket price was an all-in price including all service charges and fees. New ticket purchases will be subject to Ticketmaster service fees ($8.70 fee on $99.00 two-day tickets, and $7.70 on $49.50 single day tickets). Stay tuned for more information regarding the on-site camping details for Fort camping ticket holders a well as details on the new late night venue. The staff at the St. Augustine Amphitheatre has been incredibly welcoming and supportive of our event and we have been working round-the-clock to create an incredibly special experience. Thanks for your all your support during these changes. It is with great regret that we deliver the news that our upcoming concert at Fort Clinch State Park has been cancelled by the park administration. The production and logistics plans put in place were deemed potentially detrimental to the historic landmark by Fort Clinch and city officials. The overall safety of the fans, band and crew members, and the Fort itself were all factors considered when making this difficult decision. That said, we are excited to announce that we have secured an alternate location in Northern Florida to deliver you a new, unique music-filled weekend as promised. The Fort lineup will move locations to the Saint Augustine Amphitheatre in Saint Augustine, Florida, on Friday April 10th and Saturday April 11th as originally planned. Each night will feature an extended Lettuce set followed by two sets of Umphrey’s McGee. While a derivation from our original plan, the beautiful location is nestled amongst the natural trails of Anastasia State Park in the historic beachside town of Saint Augustine. The amphitheater parking lots will open at 3:00 pm on Friday and 2:00 pm on Saturday (tailgating encouraged), and will feature pre-show live music, local food trucks, and an overall festive vibe. Tickets purchased for The Fort will be honored at the new location and will now include an event poster from master illustrator David Welker (Phish, The Black Keys, Widespread Panic) as well as audio downloads for both Umphrey’s shows and Lettuce sets. umVIP packages will also be transferable to the new event. umVIP purchasers can expect all the same amenities including a private VIP viewing deck with private bar, bathrooms, pre-show food, live video concert feed, and more. As planned, we will be able to accommodate all current campers in a primitive camping area adjacent to the venue; no new camping will be available. Additionally, we are finding a new home for both late night performances (Omega Moos on 04.11, and the Band formerly known as the Fort Clinch All-Stars on 04.12); both will proceed as planned. All late night tickets will be honored. There will be a very limited release of additional late night tickets once we finalize the new venue details. For those not interested in this new adventure, full refunds for both general admission and umVIP will be available beginning Thursday, April 2nd. Details will be emailed to purchasers directly. This change of location does allow us to offer more music than previously scheduled, with entertainment on a second stage in the parking lot, and more music from both Lettuce and Umphrey’s McGee. The new venue will also allow for added capacity so we are pleased to offer additional tickets for the weekend. Tickets will go on sale on Monday at 12:00 pm ET. Single day tickets will be $49.50, two-day tickets $99.00. New ticket purchases will not include the show poster and downloads we will be offering to current The Fort ticket holders. Umphrey’s McGee prides itself on pushing the envelope and creating new and exciting events to share with our fans. We hope everyone understands we did everything we possibly could to see this through fruition and are truly sorry for any hassles caused by this change of plans. We hope you will join us in Saint Augustine at this remarkable venue as we take some Florida lemons and make lemonade. Watch this video to get a feel for our new home come April 10th and 11th and check back soon for additional details and updates. @WidespreadPanic @trondossafest @TheWoodBrothers @Marcuskingband @RKSBandOfficial @CarolineRoseFM Can’t wait boys!